Ten years ago GM Onstar won the Last Gadget competition. A few years later CarMD tapped into the car’s diagnostic port and let you diagnose potential car trouble. This year Mavizon’s AutoBot is “Onstar for those on a budget”. For under $300 (the price is still being determined) you’ll get a small box that plugs into the car and reports back to your mobile phone. Not only will it check the car’s vital signs like the need for an oil change, but it can send an emergency call if your air bag is deployed, remind you where you’ve parked, and act like a GPS. It even has a Groupon like coupon feature to get you the best deals on everything from new tires to a lube job. You get a coupon or two but there’s no monthy service charge for using Mavizon. 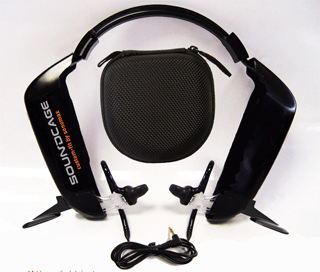 Sonomax Soundcage is a kit that lets you make your own custom fit earphones. You buy the Sonomax earphones encased in a plastic headpiece. Place the plugs in your ears and a tube of inflatable silicon shapes the plug to match your ears. Once you’ve shaped your plugs (four minutes later) you toss away the headpiece. Lapiac entered a bracelet locator that helps you keep tabs on everyone from an outdoor adventurer to an aging parent to a prison parolee. It relies on Assisted GPS technology for indoor and outdoor coverage, logs movement, and can be used to set up geofences. For those who think even a mobile phone is too big to tuck in a pocket or purse, Sony Ericcson just introduced its LiveView microdisplay, a tiny square screen that notifies you about incoming calls and social media feeds. It’s designed to work with the company’s Xperia phones. IdealLife, a line of products that lets caretakers monitor patients, is built around a single Bluetooth hub that can talk to everything from pulse meters, to blood pressure cuffs, to scales, pedometers and more. A line of expandable high-tech products for home health represents a first.